This cinema is fondly remembered by many Exonians who visited in the war years to forget the bombing and during the post war period, to enjoy a Saturday night at the pictures. Set back from the High Street, it was designed by W R Glen in 1936, in a Thirties, art deco style and was considered to be Britain's most technologically advanced cinema to date. Commissioned by Associated British Cinemas who were formed in 1928, the company also ran cinemas under the Regal and Ritz names. Their new cinema would be built on the site of the New London Inn, which they purchased on 29 September 1935 and closed on 2 November 1935. Built of contrasting brick and plaster, by Brazier and Son of Southampton, the front echoed the lines of the bridge of a ship. To the right of the entrance, and integral with the cinema, was the New London Inn, named after the well loved inn that was built in 1793-94 and demolished in February 1936, ready for the cinema's construction. The ABC was well suited to the existing shape of the land on which it was built, with the front curving around the corner on the right side, much like the New London Inn. The gigantic steel girder used in the construction was believed to have been the largest in the city with a length of 100ft, depth of 8 ft, width of 2 ft and weighing 25 tons. The auditorium seated 1224 in the stalls and 734 in the circle. Projection was with three Ross kinematograph machines and a sound system by Western Electric, later RCA. It also had the very latest in 1930's air-conditioning installed. It was estimated to have cost between £6,000 and £7,000 to build. 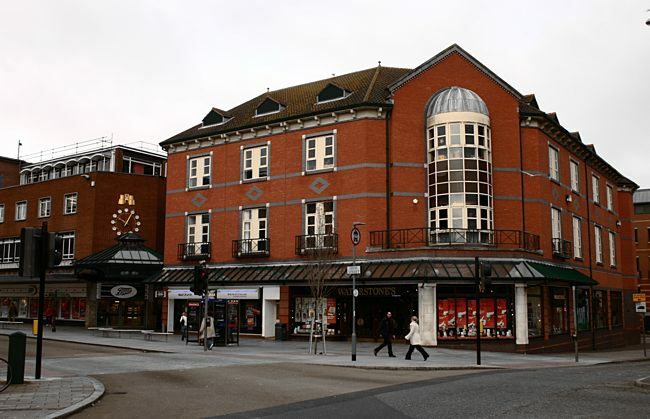 Associated British Cinemas Ltd appointed Mr E V S Forgham as the manager – he had been with the company for eight years, previously managing the Pavilion at Wylde Green, Birmingham. 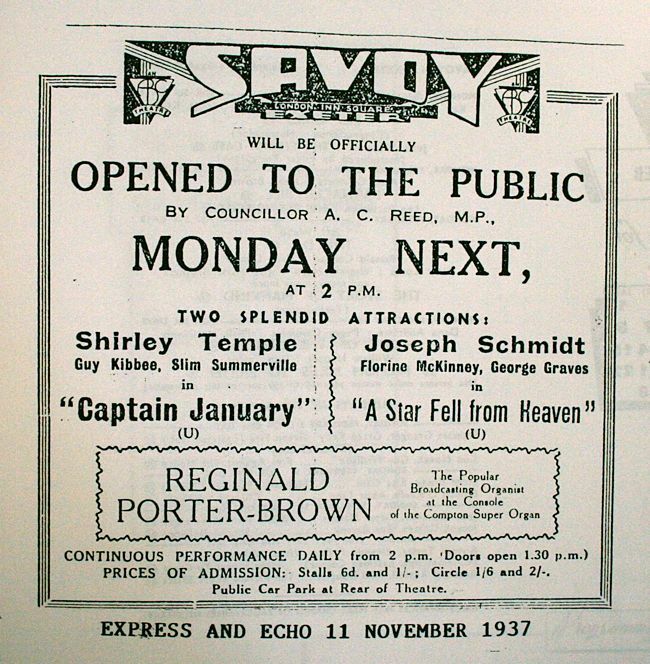 The new cinema was opened by Councillor Arthur Reed on the 22nd November 1936 and the first films to be screened to the public on Monday 23rd November 1936 were Shirley Temple in 'Captain January' and 'A Star Fell from Heaven'. The 3 manual and 6 rank, Compton 'Super' Organ was played by Reginald Porter Brown from the Regal, Torquay. 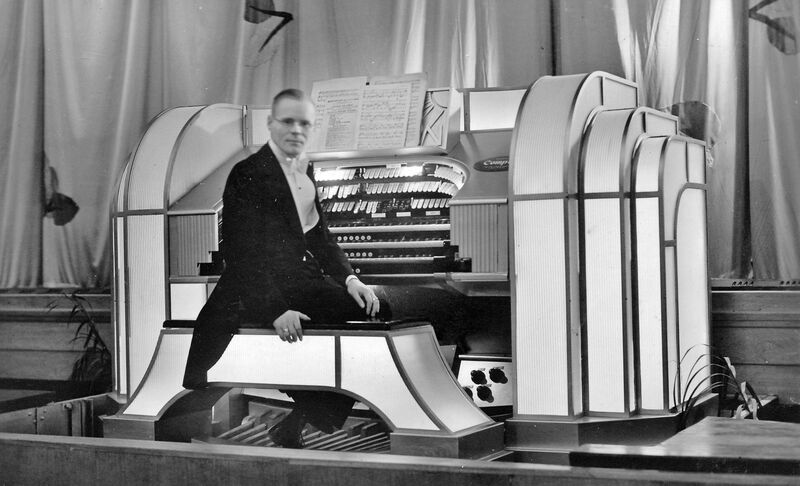 The regular organist was Harold Stringer, who went on to perform on a regular basis, including broadcasting concerts for the BBC. His signature tune was Glorious Devon, with which he always opened the interlude. Glorious Devon played by Peter Holladay. 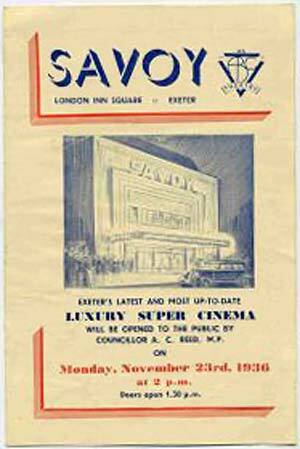 "The Savoy Cinema, another steel framed structure, appears to have received 18 fire bombs on its roof. Four penetrated and were dealt with by the fire watchers, who say that here the H.E. which hit the nearby Plaza, sent up a big sheet of flame. 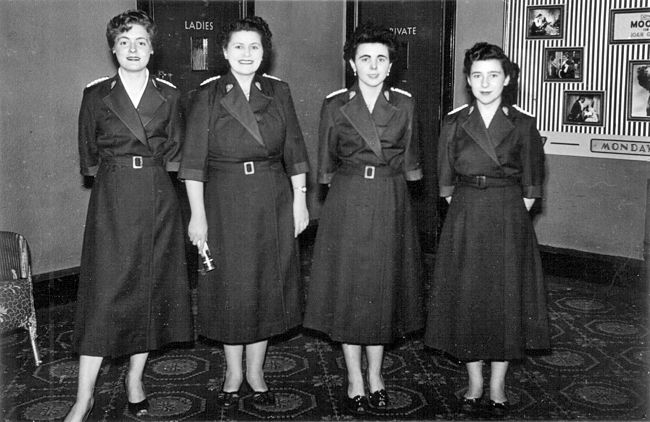 The fire guards saved the Savoy Cinem"'. "Fire also broke out in the New London Inn which is underneath the Savoy Cinema, but was held by the fire guards and extinguished." Although the cinema was saved, the console of the Compton Super Organ was destroyed. The cinema had a popular Saturday morning film show which showed cartoons, a cliff hanging serial and a feature, along with talent shows and singing. Harold Stringer, the resident organist would often open the proceedings as the huge organ rose from in front of the stage, playing the ABC Minors Club Song. To see the films we like and shout aloud with glee. The last 'ABC' was to be sung as loudly as possible. Blaize Away was also played to warn staff if there was a fire in the building and an evacuation was needed. 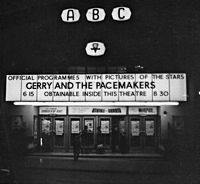 Renamed the ABC in November 1960, the cinema's stage was used for many pop concerts, and the Beatles gave three shows, the first supporting Tommy Roe and Chris Montez on the 28th March 1963. Part of this show was recorded for BBC 2's 'On the Scene'. They then performed on 14th November 1963 and 28th October 1964 as the headline act. The show of the 28th October was sold out 8 weeks before. On the way to the ABC for the 8 o'clock show, the Beatles transport got lost, causing them to miss the meeting at Honiton with a decoy van, and arrive for the show with only minutes to go. Ringo was asked what had happened and he remarked that the driver had taken the wrong turning down a lane (this was before the M5 motorway) but that they had found a very nice 'fish and chip shop'. They went on the stage to face a theatre full of screaming fans. "I cried all the way through. Someone put their arm around me and didn't know who it was. We couldn't really hear the music because of all the screaming." The next act to appear at the ABC was Cliff Richard and the Shadows on 18th November 1964. Other acts appeared on the stage over the years including Morecambe & Wise, on the 15/16th October 1971 and Roy Orbison and Frankie Howard. 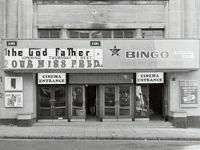 In 1972, the ABC closed for twinning, when the organ was removed and the interior rebuilt to give the 504 seater ABC 1, the 128 seater ABC 2 and the stalls became a bingo hall. On the 25th January 1973 the ABC opened with the Godfather on screen 2. The open area at the front of the building, London Inn Square, was a favourite meeting place for Exonians - in 1980 a vigil was held there after the murder of John Lennon. The ABC, was absorbed into the Cannon cinema empire, but retained its name until closure. When notice of its closure became known, a petition was organised by Winifred Walsh who collected 4,000 names, which was passed to the City Council, with no success. It projected its last film 'Personal Services' starring Julie Walters and 'Top Gun' with Tom Cruise, on 4th June 1987. 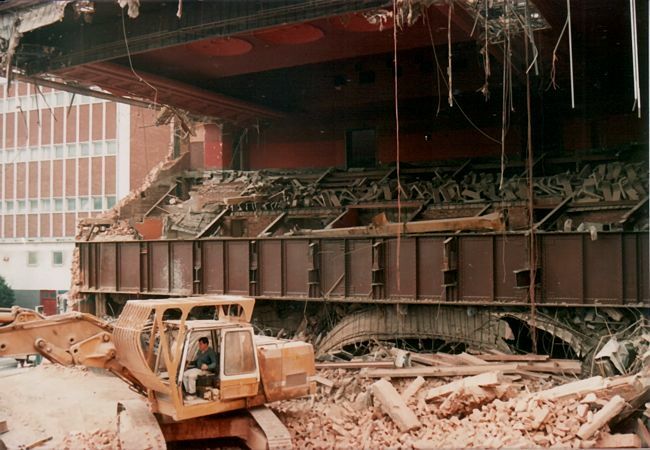 Demolition commenced on August Bank Holiday Monday, 1987, fifty years to the day since the Odeon in Sidwell Street opened. Just like the previous New London Inn, many artefacts from the demolished cinema were sold off to cinema enthusiasts. Cinema curtains, lights and 57 solid oak fire doors were all disposed of. 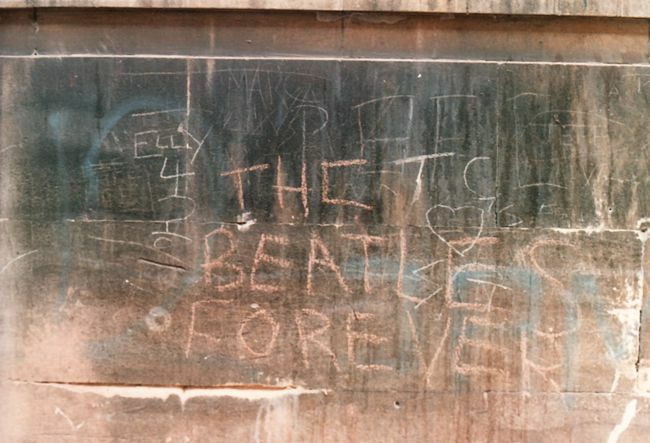 Signatures left by the Beatles after one of their shows were discovered on one of the walls near the dressing rooms. The site was searched by the Exeter Archaeological Unit after demolition and they discovered city defences from the Civil War, and a late 18th-century bakery oven. 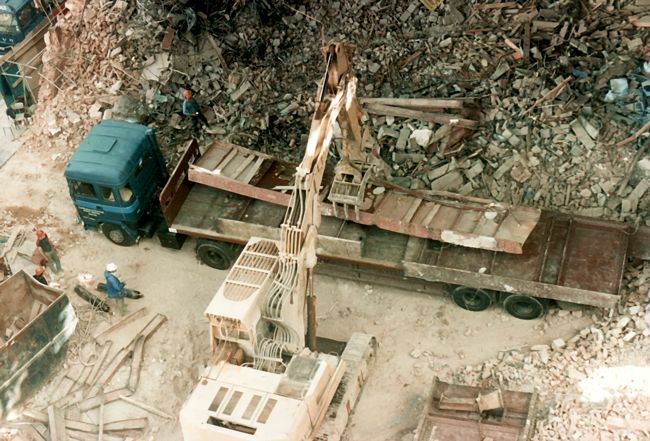 The demolition was undertaken by Demolition Services of Leeds, often watched by a large crowd of spectators. One mishap occurred when some masonry fell, injuring a 16 year old girl. And the replacement for the Savoy? a branch of Dillon's (now Waterstones) the book store. 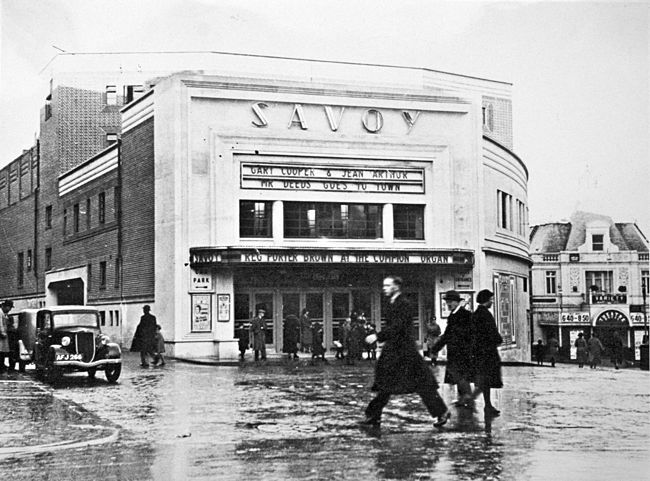 The Savoy Cinema just after it opened in 1936. Courtesy Express and Echo. 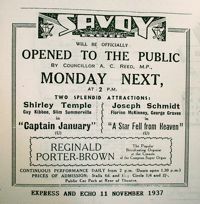 An advert for the opeining of the Savoy - November 1936. 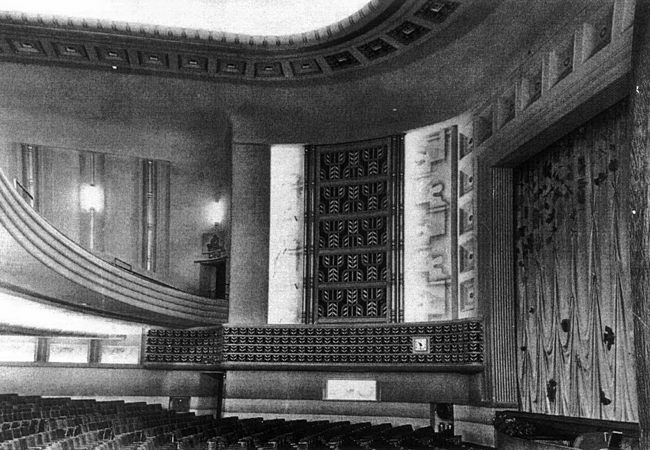 The auditorium and screen circa 1936. 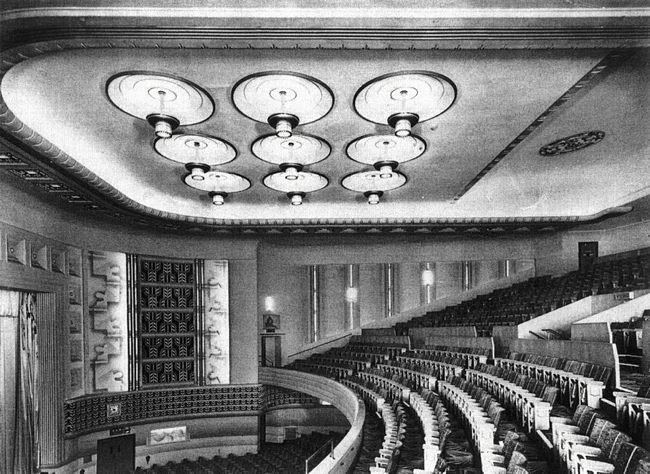 The dress circle and ceiling, circa 1936. Harold Singer at the ABC Compton organ. 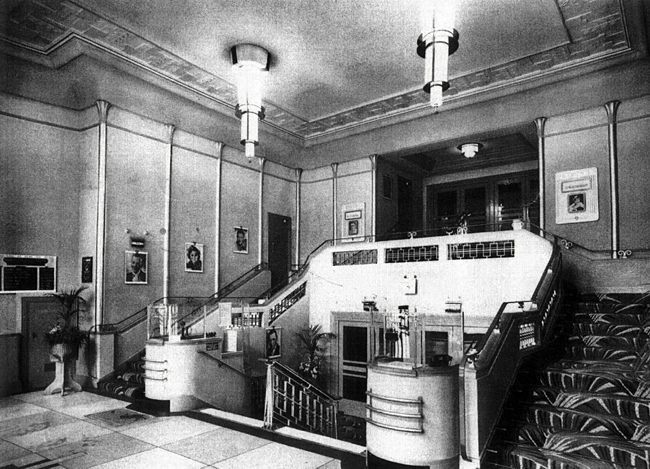 The entrance foyer circa 1936. 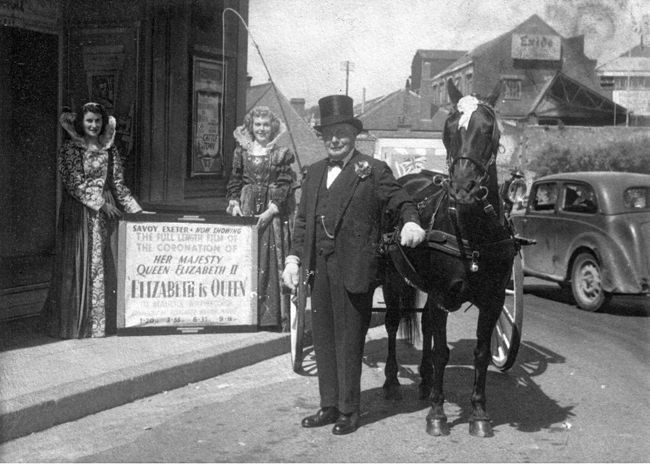 A promotion for the Coronation in 1953. © © Stan and Betty Mallett. 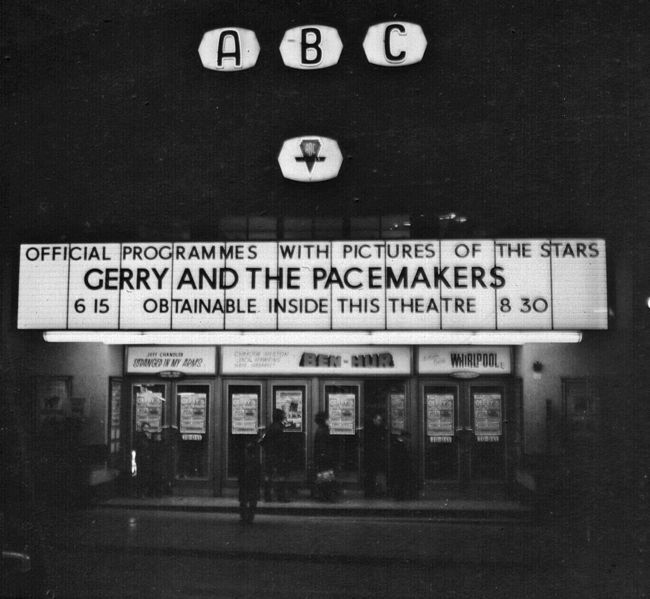 The canopy lit up for a Gerry and the Pacemakers, live show, circa 1963. © © Stan and Betty Mallett. 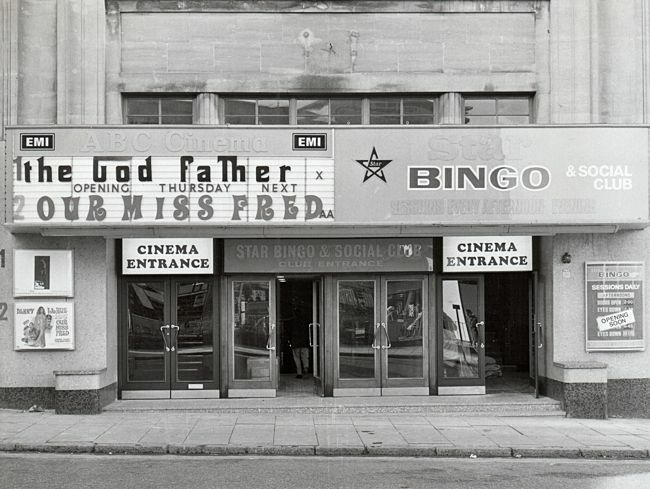 The front of the ABC when the Godfather was playing. 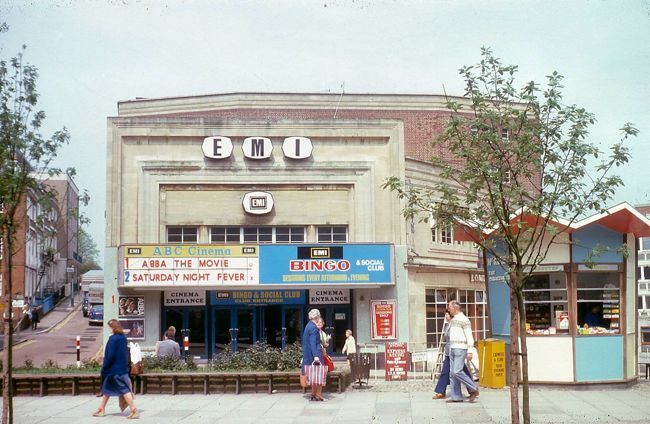 Nice photo of the EMI/ABC in the 1980s, showing London Inn Square and the McGaheys kiosk. Photo Tony Laskey. 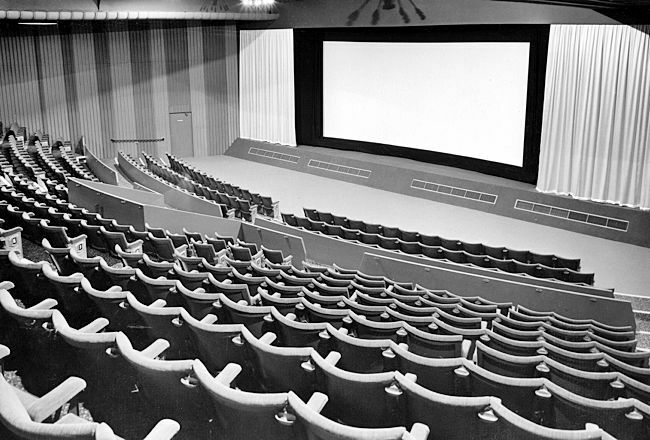 The auditorium of the ABC, before it became a multi-screen cinema. 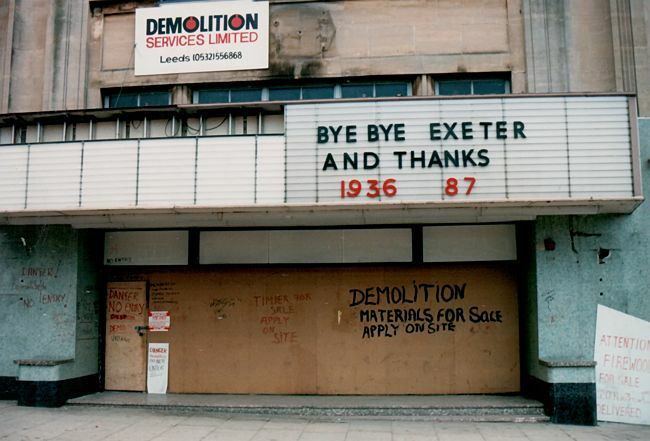 Photos from Stan Mallett's photo essay 'Death of a cinema'. 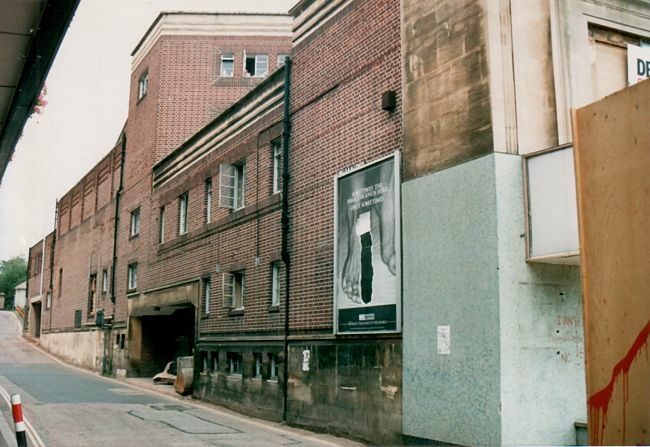 Boarded up, ready for demolition in 1987. © Stan and Betty Mallett. Looking down into the auditorium, as the digger removes the main girder. © Stan and Betty Mallett. The main girder holding up the dress circle. © © Stan and Betty Mallett. The girder, holding the circle up, had a length of 100ft, depth of 8 ft, width of 2 ft and weighed 25 tons. © Stan and Betty Mallett. The side of the ABC in Northernhay Street. © Stan and Betty Mallett. 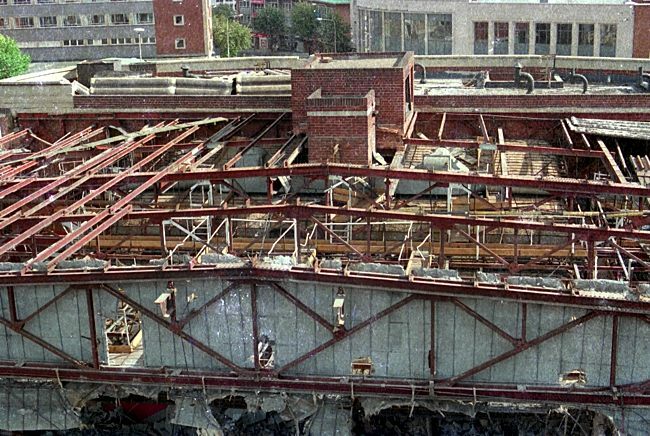 The roof of the ABC during the demolition. © Stan and Betty Mallett. Graphitti scratched on a wall from one of the Beatles concerts in the 1960s. © Stan and Betty Mallett. Waterstones now stands on the site of the much missed ABC Cinema. © David Cornforth.